The shelves are 18"x 35" and are spaced roughly 14" apart. The bookcase itself is 38" wide x 18" deep x 54" tall. 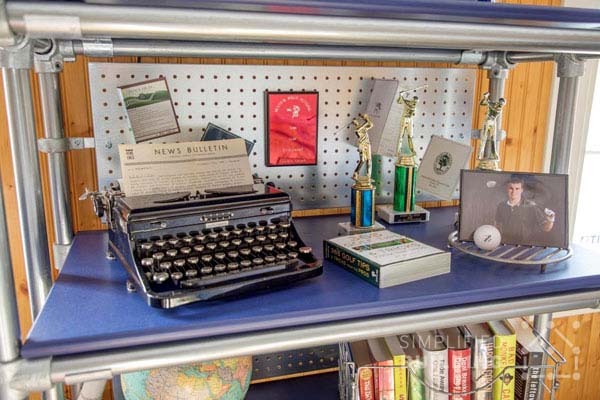 For the peg boards at the back of the bookcase frame, Carolyn ordered some custom size, metal pegboards from DiamondLife. 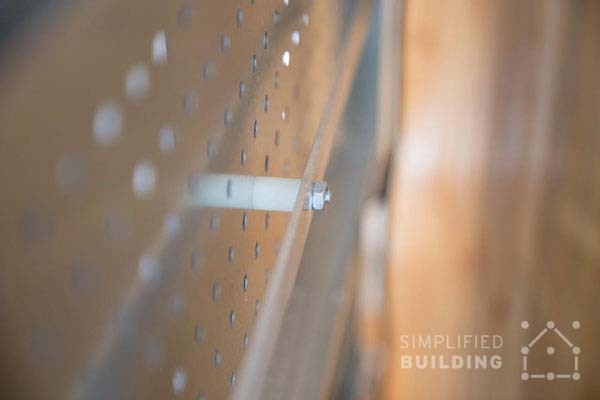 The custom pegboards are 12" x 32". 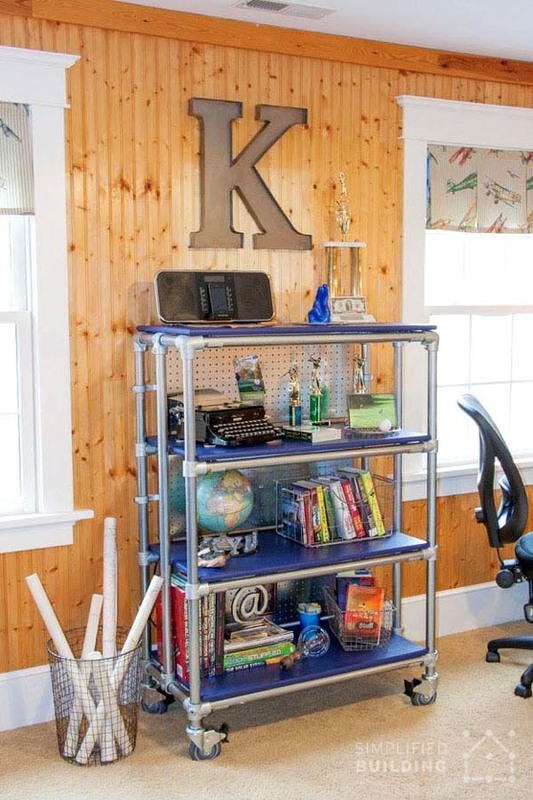 "I put the metal pegboards on the backside of each shelf so it would match with the desk I had found. 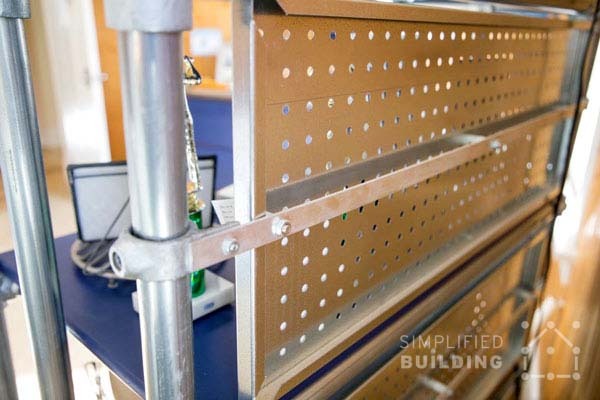 I like that I can hang things on the pegboard using magnets too." Carolyn then drilled holes in the bar and and bolted it to the pegboard and Fixing Pad fittings. 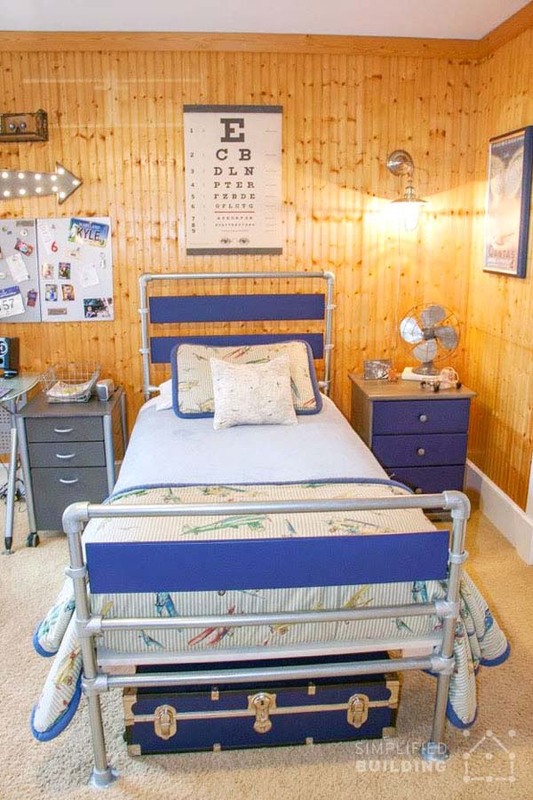 "I was decorating my teenage son’s room to give it an industrial feel so I wanted to build a pipe bed. I needed a bookcase as well for the room, but couldn’t find a pre-made one that matched the feel I was going for. So I drew out my vision and then created one using the Kee Klamps and pipes. I have been very happy with the final result. It really is a one-of-a-kind piece and adds to that industrial vibe I was going for. 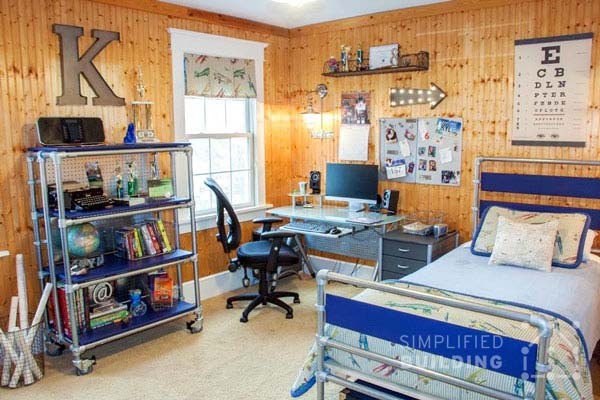 Overall, I can’t be happier with the final look of the whole room and I'm so proud I was able to build the bed and the bookcase out of Kee Klamps and pipes." 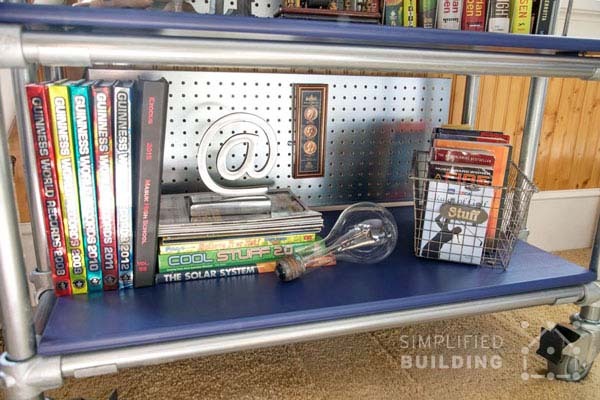 Listed below are the fittings and pipe you'll need to build a bookcase like the one Carolyn built. 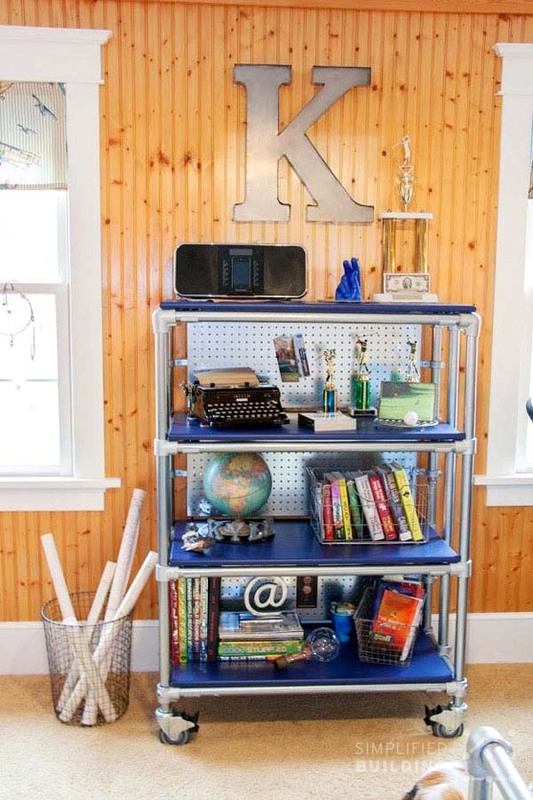 However, the design can, of course, be modified to include more or fewer shelves or change in height, width, and depth. It's entirely up to you. 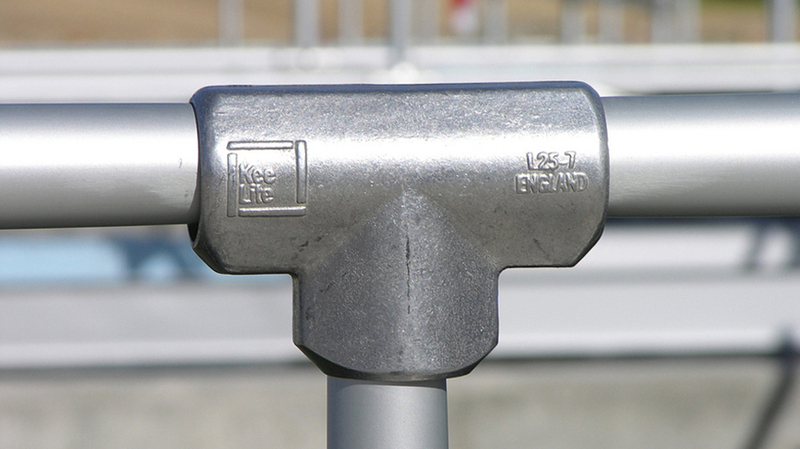 Also, when you use Kee Klamp, since it uses a set screw to tighten down to the pipe, you can always loosen the fittings to make adjustments, even after assembly. 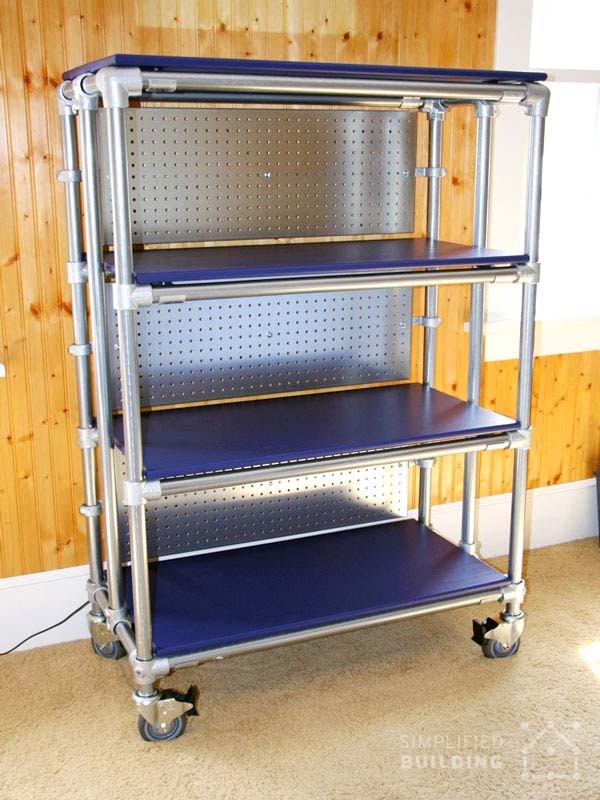 This makes it possible to adjust the height of shelves or to completely disassemble and reassemble the unit. As with any Kee Klamp project, exact order on how you assemble your project is entirely up to you and how you would like to approach the assembly process. With that said, however, we have listed detailed steps and diagrams below for assembling the bookcase. To assemble the bookcase frame, we recommend building it in sections, assembling the front and back sides and then joining them together. 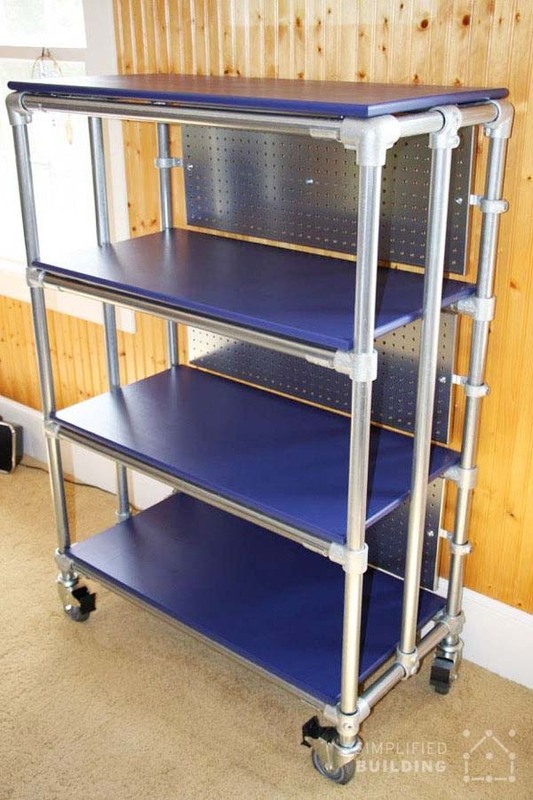 To do this, you'll need to assemble each vertical upright first. Starting with the front, take one of the the 54" lengths of pipe and follow the diagram in Step 1 to attach the fittings. 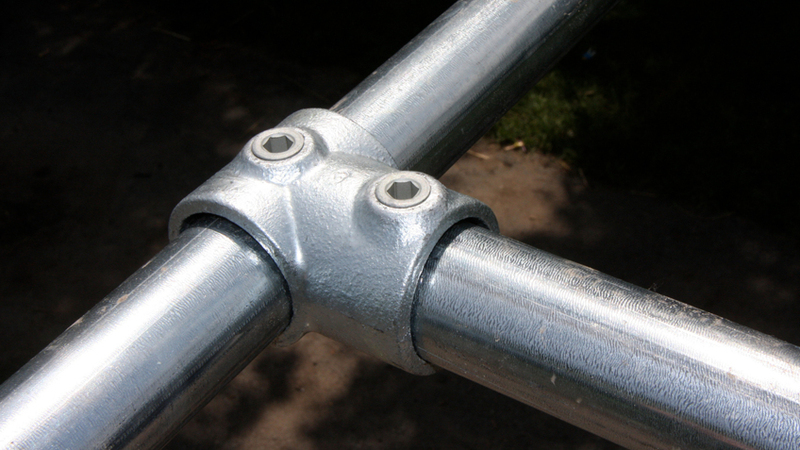 Each fitting has a set screw that, when tightened down with an Allen Wrench, will secure it to the pipe. Also, be sure to use a measuring tape to mark the height of each fitting. Doing this will allow you to set the same fitting height on each upright (so your shelves are level). Now, you should have a complete upright as pictured in Step 2. Repeat this process for the other upright and join them together using the 38" lengths of pipe. Follow the diagram in Step 3 for a better look. Once complete, the frame should like the diagram in Step 4. This is the front section. You will repeat these process for the back section with one exception. 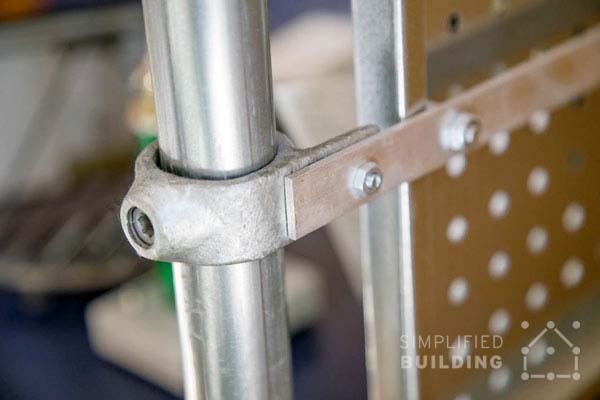 Each back upright will utilize four Fixing Pad fittings (one between each of the other fittings used on the upright). These will be used to attach the pegboards to the back of the frame. Follow the diagram in Step 5 for a better look. Now, the front and back sections should be complete. From here, you'll need to assemble the supports that connect the two sections. There should be two 54" lengths of pipe left. On each of these, add a Single Socket Tee fitting on each end of the pipe (be sure to leave enough space to allow pipe to slide through the open socket on the other end of the Single Socket Tee fitting). 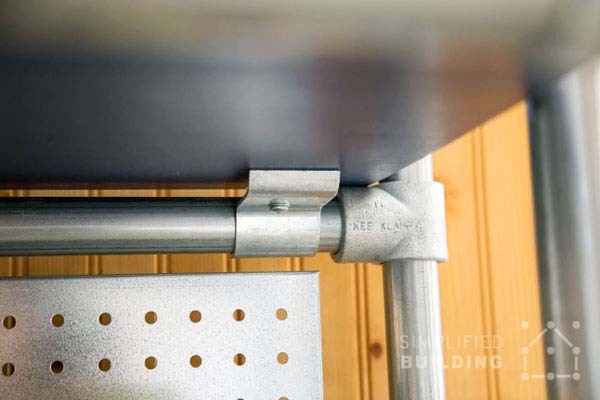 From there, add one of the 18" lengths of pipe into the open socket on each of these fittings. Tighten down the set screw on each fitting to secure it in place. You should now have two pieces that look like the diagram in Step 8. Now, you can join the front and back sections together. You may want to have someone help you out at this point since each of these sections can be rather heavy. Follow the diagram in Step 9 to connect the sections. The frame should now be complete as pictured in Step 10. Now, all you have left to do is attach the shelves. First, slide them into place. You can leave them unattached to the frame if you like. But to keep them from moving too much, you'll want to secure them down. To do this, you can use the Sheeting Clip. The Sheeting Clip will slide over the pipe and will have a hole in it on the other side to drill it into the bottom of the shelf. The tension created by doing this on all four sides will hold the shelves in place. Once that's done, you're all set. 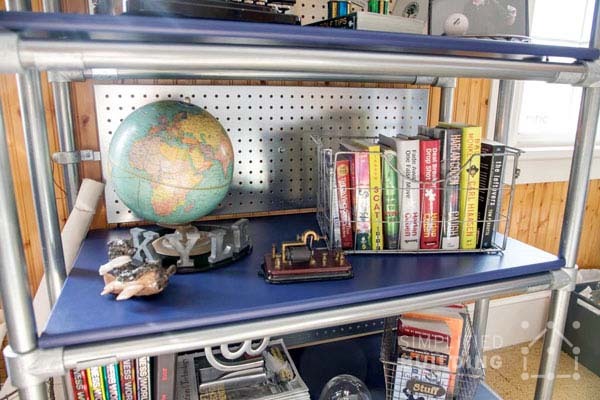 You should now have a rolling bookcase as pictured in Step 12. If you have any problems assembling the bookcase, or need some help designing a custom solution, don't hesitate to reach out to our projects team for assistance. 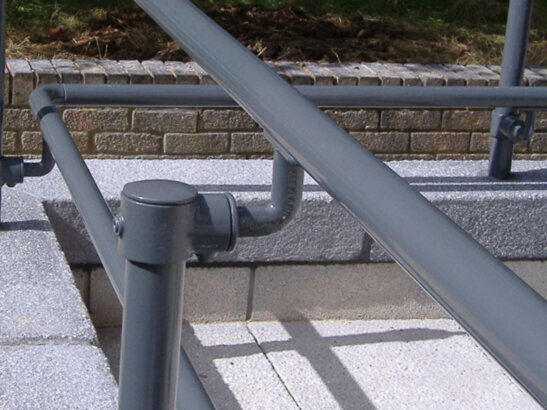 Our team is experienced in using Kee Klamp and has helped many customers come up with their own perfect design. Did you enjoy this article? 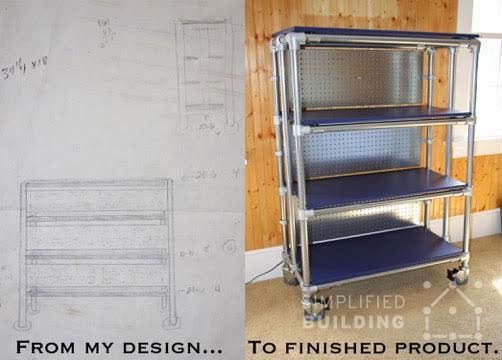 Let us know in the comments below what you thought of Carolyn's rolling bookcase and be sure to sign up to our email newsletter to receive updates on future projects like this one.